You’re young, You’re truck mad, your dad’s truck mad, you drive a truck, your dad drives a truck, but you live in Taunton. 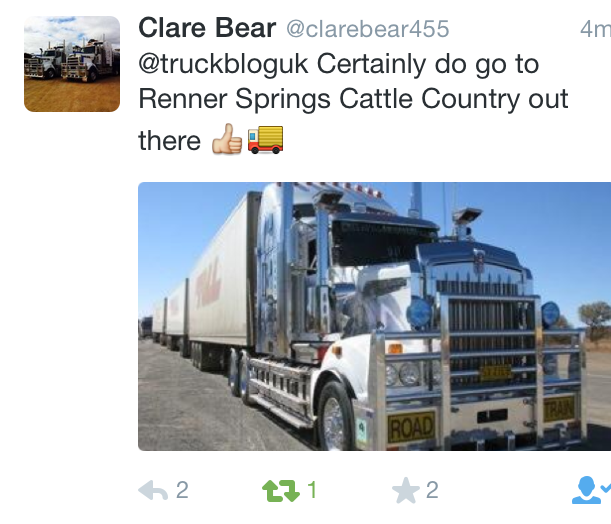 Not exactly the home of UK trucking or indeed road train trucking, so what do you do??……. Yep that’s right, head off to warmer climbs where big trucks roam free across the endless expanse of dirt tracks, tarmac, desert, rainforest and what ever else is in between, you guessed it, Bristol sorry, sorry I meant Australia of course! 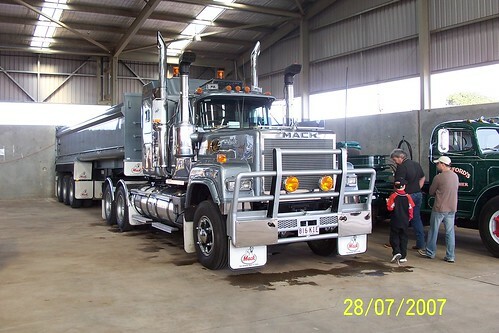 If you want to see some big trucks and get to work with big trucks why not do as our man in Kangaroo country has done and sign up for a farming team in Oz. Young Jack Rigby is truck mad, having an owner driver for a dad, did Jack ever stand a chance of having a career doing anything else? No of course not, every Owner Drivers child wants to grow up like their dad don’t they??? Not scared of a gear stick like many new/young drivers are, or indeed hardwork, Jack has been hard at it with his team harvesting Australia’s crops and getting to ride and also drive some absolute beauties. As is the case these days in Oz, there seems to be a real mishmash of American type and European type trucks. Luckily for Jack he’s tried all of them and none better than the triple trailered Kenworth above. The beauty of this all is that Jack can utilise both his agricultural skills and truck driver skills all in one. Just listen to that engine grumble away, you can virtually feel the ground shaking as she picks up speed. Time to give Jack a pat on the back with those gear changes, as you may have noticed he’s not using a clutch pedal. As Jack is at an age of post gear lever trucks here in the UK it’s nice to see a young whipper snapper with such great skill. I think just one little missed gear is perfectly acceptable considering. 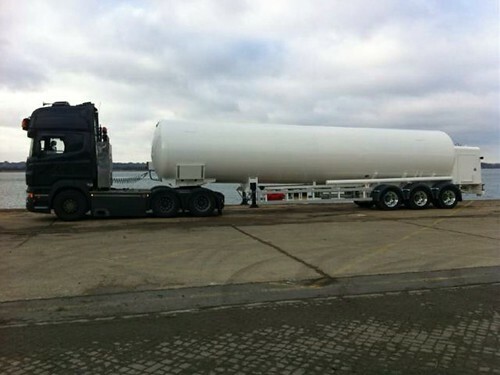 Lots of European trucks over in Oz these days. Traditionally big American trucks have always been most popular but these days it seems to be much more of an even split between American and European trucks. 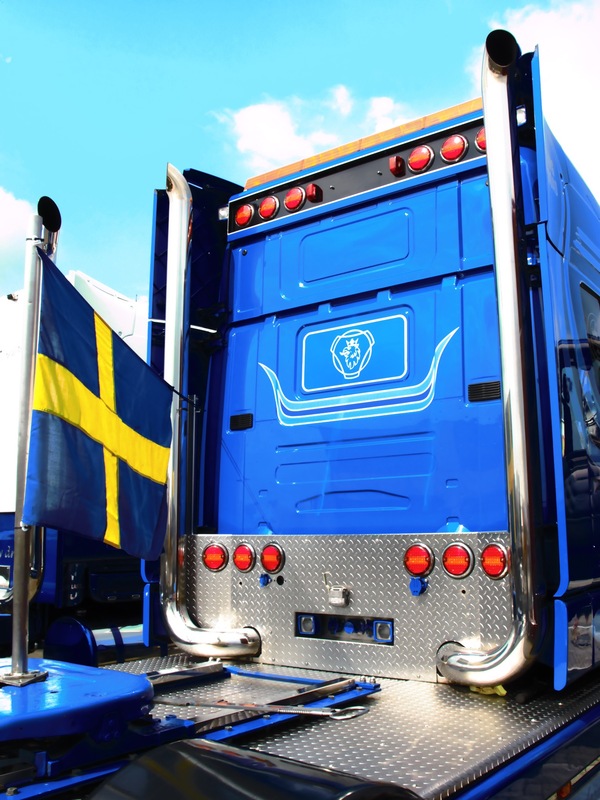 The team Jack is working with are clearly fans of European trucks as they have a good number of Volvo’s and some ageing Scania’s still in use. If I know Jack a little then he’ll be keen to try as many as he can and hopefully he’ll collect enough photos and tales of the Australian roads and farming that he’ll write some blogs himself when he is back in Blighty. 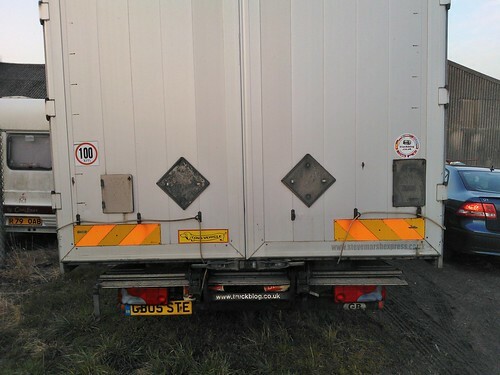 Due to licensing the tidy Volvo below with a single trailer is one of Jacks regular seats. 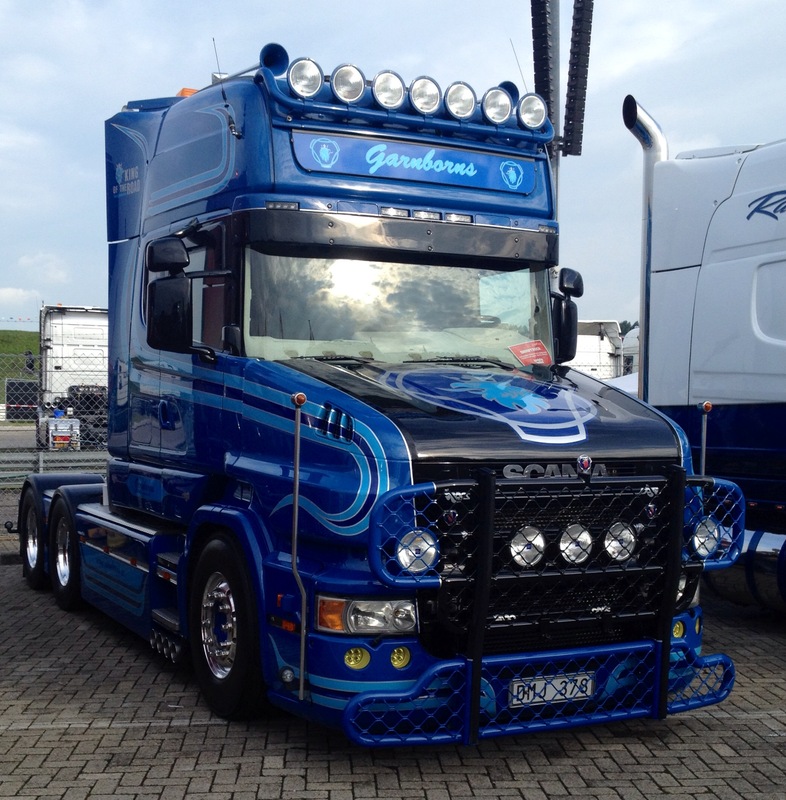 For me this is the best truck I have seen in 2014. It might not be the newest, it might not be most practical for most of Europe and it certainly won’t be everyones taste but for me, spot on. 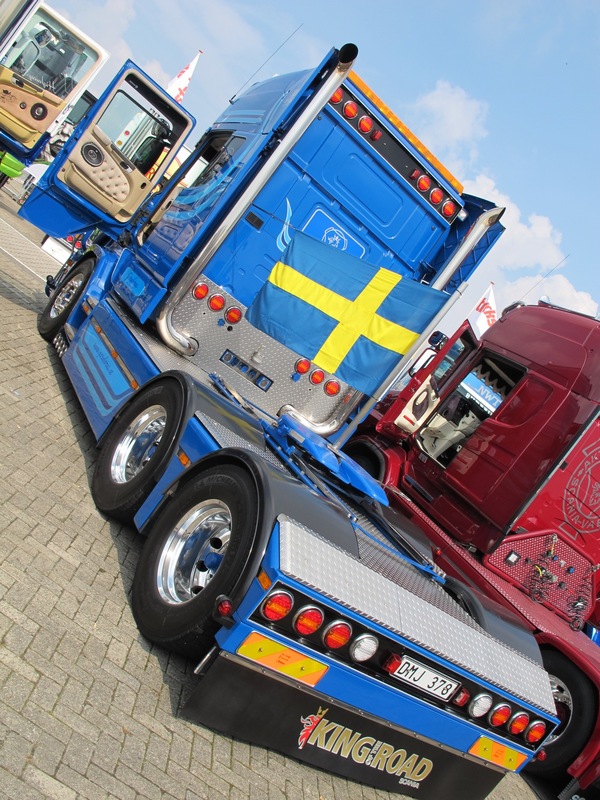 If you live in the UK and haven’t been to one I strongly advise that you make 2015 your first trip to a European truck show, the standard of trucks is amazing. 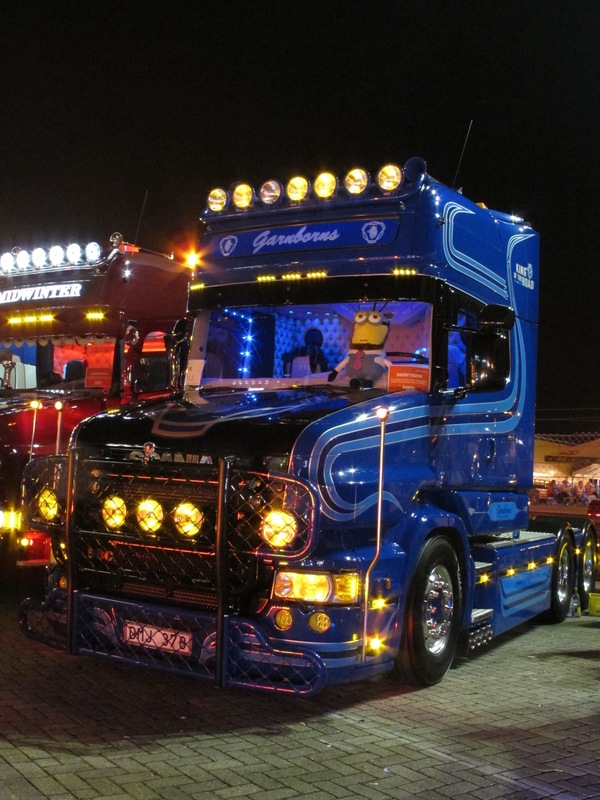 I can’t deny that the trucks here in the UK are getting better and better but the Europeans just seem to have it right, they all look good. To me the best trucks have always been out of reach of what I could afford or achieve and the T560 is no different. We all joke about winning the lottery but a Tcab would be very close to the top of my list. It’s blue, it’s got two sets of pipes, it’s got a subtle custom interior and enough lights to make it look good but not over the top. As with anything I would make a few subtle changes as I’d want to put my mark on it. 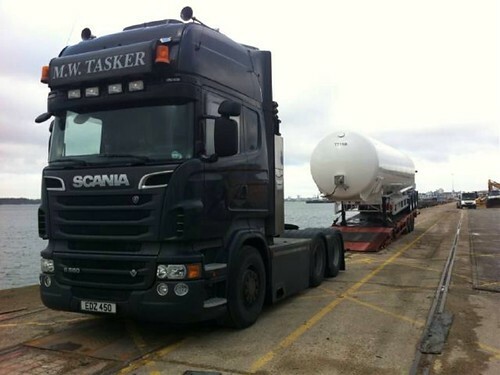 2014 has seen a big rise in the blogs popularity through all mediums, the Facebook page, twitter and the good old fashioned http://www.truckblog.co.uk website. I’m not going to link to any of those this time round as I’m sure you all could do with a break from the ruthless links and plugs for the blog. I have no idea where the blog will be in another 12 months, hopefully you’ll all still send me stuff, photos, info and the odd piece of trucking memorabilia to decorate TBHQ and I’ll keep bugging the TV companies in the vague hope they’ll see that we need Truckblog TV! Hopefully I’ll be visiting, Truckfest Peterborough, Crowfield Truck Rally, Gathering of the Griffin, Retro Truck Show at Gaydon, more than likely (and hopefully) Truckstar Festival at Assen as my foreign trip, although I have heard on the grapevine that there is quite a convoy of English motors heading to the International Trucker & Country Show held at Interlaken, CH. I have always wanted to go James?? Finally if the offer is still there then I might just make it to Belfast too. Anyway thank you for following and thank you for making the blog what it is, without your contributions I’m sure you’d all be bored silly of 143’s, MAN TGL LX’s and Mercedes-Benz photos! As we all do secretly say now and again Keep on Trucking! 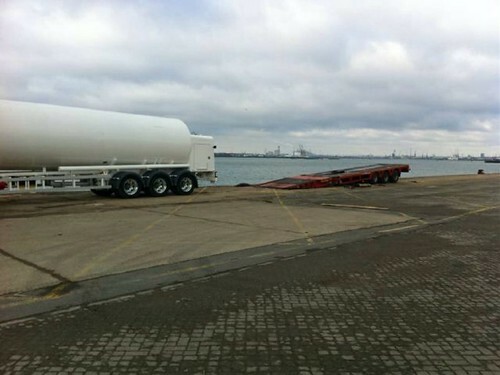 It must be something that others drivers can only imagine, a trailer that you can truly tip yourself. 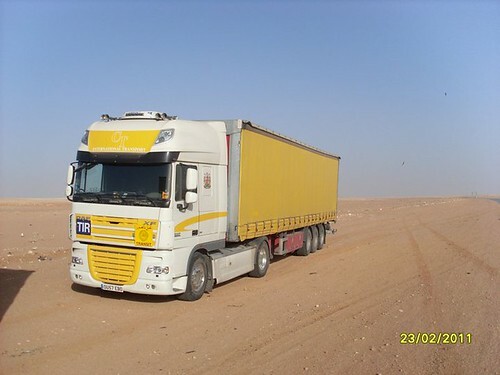 Turn up where ever and just get on and tip, no waiting for a forklift, no waiting for loading bays or for the truck in front to move, just find your space an start unloading. 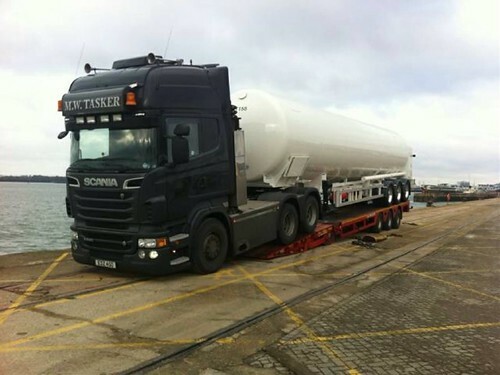 This trailer is know as a recovery trailer in the business, although HC Wilson do utilise its capabilities to do specialised jobs, such as this. 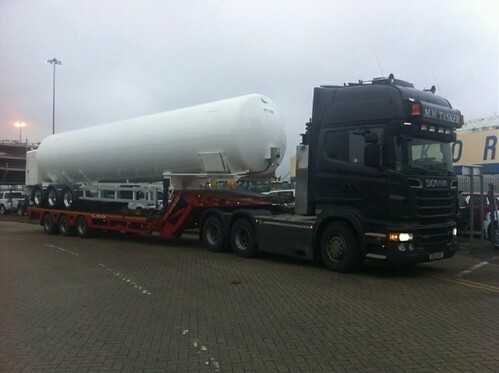 You have a specially built trailer that is destined for a customer in Australia and its not designed to run on UK roads and you don’t want it to run on UK roads you need some one who can load and deliver said trailer. Bring in a semi low loader trailer with a hydraulic fold neck and Robert is your mothers brother. As clearly displayed by HC Wilson’s top subbie MW Tasker (p.s. displayed on this occasion by a rather splendid R560 V8 Scania!). 1) Trailer dropped and after pressing the button the neck folds flat to the ground creating a very handy loading ramp. 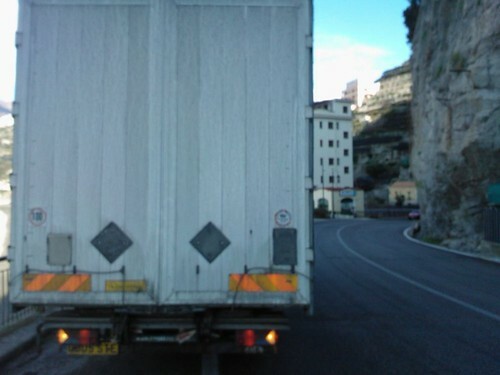 2) Reverse tractor unit up the “loading ramp”. 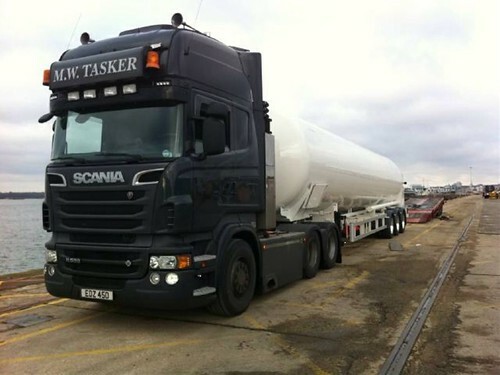 Adjust tractor unit front and rear suspension and hook up to the Ozzie tanker. 3) Drive carefully off the fold neck and Voila! Unloaded easily and with no sign of the usual loading bay jobs worth who is there just to make your day!! As it goes I think the outfit looks pretty dam cool! I can see Tasker pulling this along the dusty highways and byways of Oz. The only bugger being its only one trailer, i’m not sure if there is a tow hitch to fit a 2nd trailer which would be more Taskers thing! 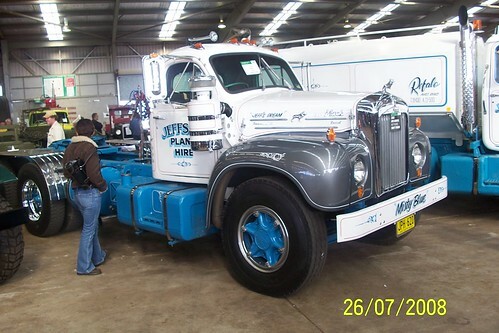 This is a Mack B-61 (6 cylinder) – seen here dressed up in the fleet colours of Jeffsan Plant Hire of Agnes Banks, NSW, Australia…..”Misty Blue”, as she is known, is a very popular truck for truck photographers like myself. Next is of a Mack B-615RS (V8) – this one belongs to a one eyed and very fastidious Mack-man, Fred Goldspring of Rutherford, NSW, Australia. Fred has done a marvellous job in restoring this truck and I am proud to say that I have met him – he has every receipt for the truck from the time the truck was first delivered through to restoration receipts and many more! 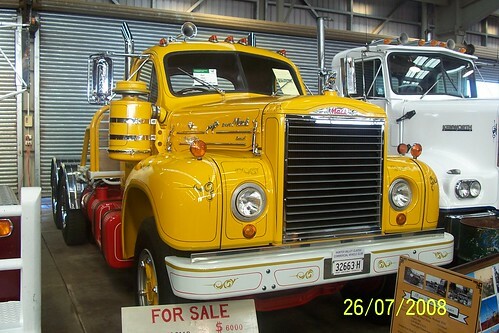 Finally an iconic truck in Australia….this is the legendary Mack SuperLiner MkII (depicted by the square headlights) – there’s only one truck even more legendary here than a standard SuperLiner and that is the BiCentennial SuperLiner! There were 16 BiCentennial SuperLiners built in 1988 to celebrate 200 years of Australia – the man who owned Room 500 has a few of them! Joe Hupp from Dubbo, NSW, Australia here with my first contributions to your wonderful blog – sorry I’ve been so slow in getting these to you. 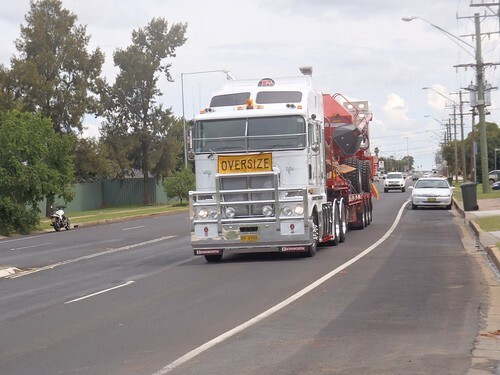 I have included two photos of the latest iteration of Kenworth Australia’s very popular K-Series cabover, the K200, and a photo of the truck that came before it, the K108. 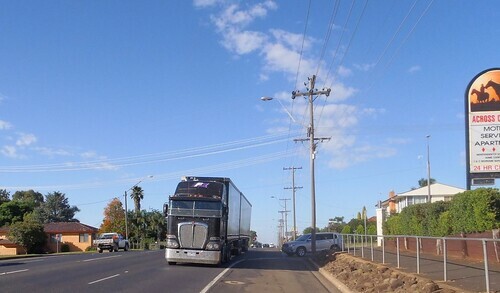 The black K200 is owned by F1 Logistics out of Mildura, Victoria, Australia (formerly GTS Freight Management). I did not catch the name of the owner of the white K200 while the third photo is of the model that came immediately before the K200, the K108. 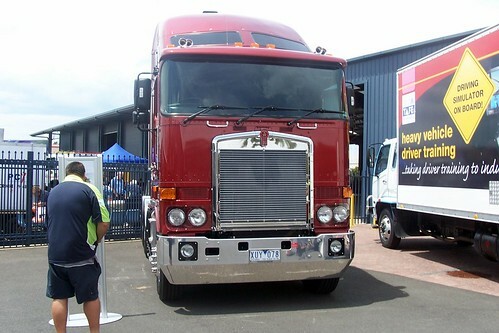 The photo of the K108 (the red one – Ben) was at the open day at Inland Truck Centre, the Kenworth dealer in Dubbo. 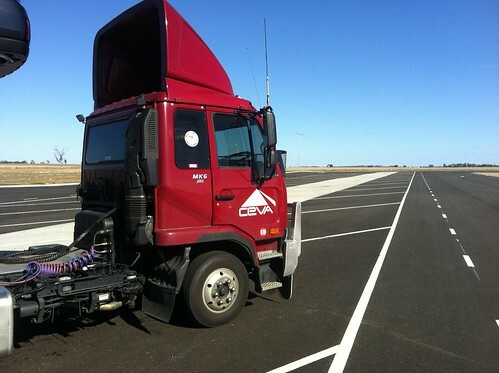 The K200’s were photographed alongside the Newell Highway, the main North-South transport route through the heart of NSW. 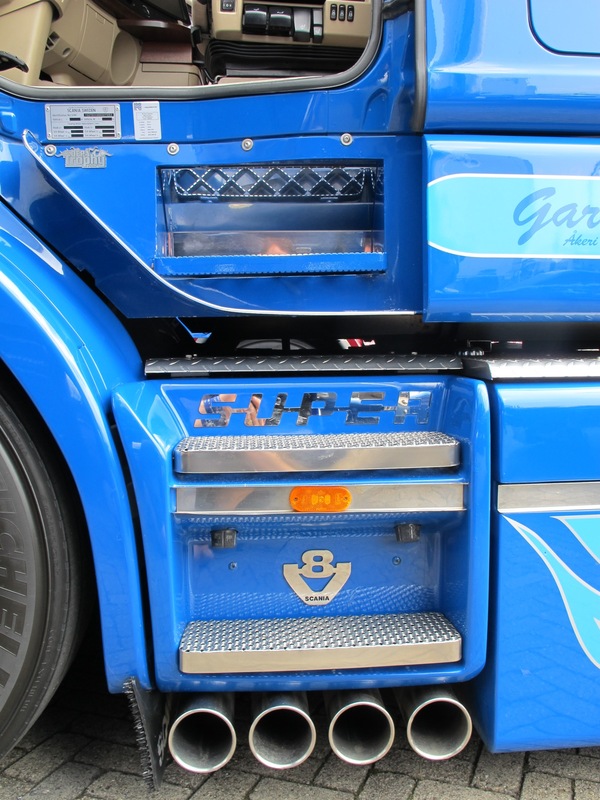 The key difference between the K108 and the K200 is the height of the cab. 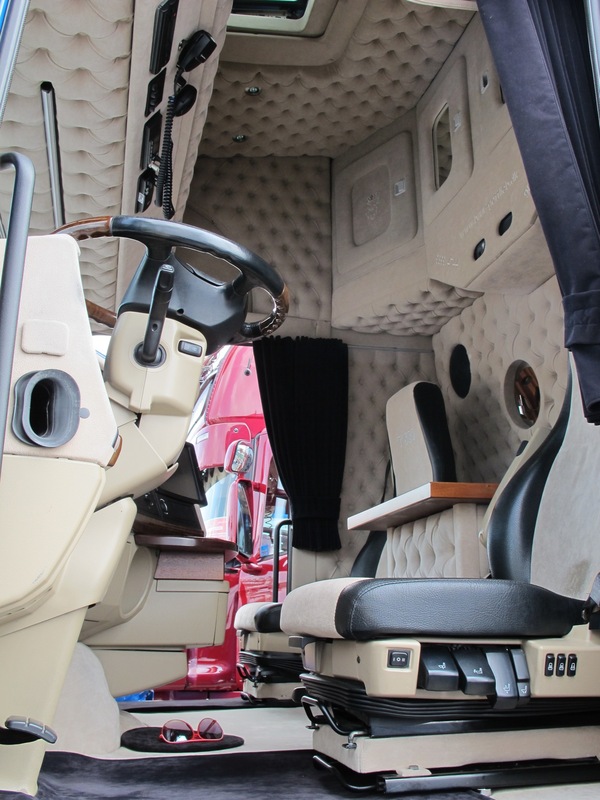 The cab was raised to allow a bigger radiator (1850 square inches) and all the associated EGR and DPF equipment that goes with the enhnaced emissions control system on the Cummins engine. Looking forward to contributing more of my photos to your wonderful blog… especially the vintage and classic trucks that opened Australia’s road transport industry up. 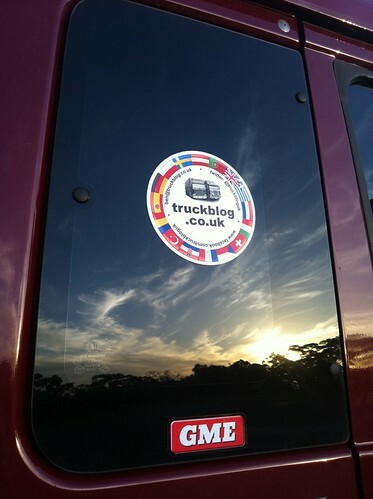 New Truckblog Stickers On The Move!! 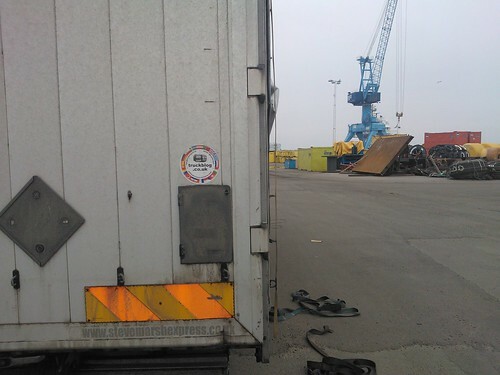 TB on the move in Norrkoping Docks, Sweden. TB on the move in Innsbruck, Austria. TB on the move in Maiori Salerno, Italy (a bit fuzzy driver!). Next up we have Andy Blunsden. An owner driver from Bristol, known to many of you as Carrot (I think!). 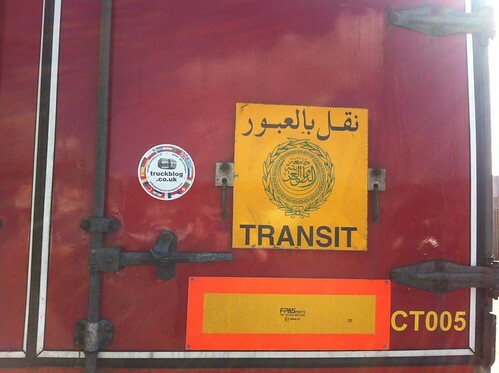 Andy has stuck one on the back of his trailer that he hauls all over Europe and also to the Middle East, although I don’t think the sticker has made it to the desert yet! 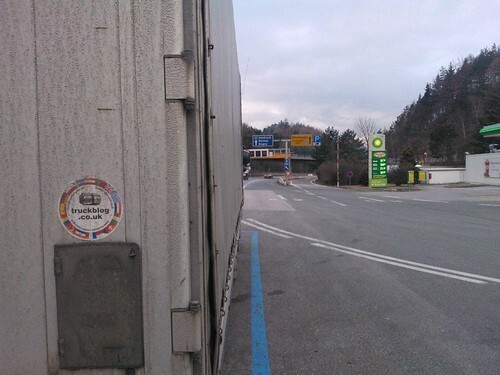 Hopefully Andy will get some inspiration from Marshy’s efforts and send a pic or 2 of the sticker on the move, perhaps even in the dustier parts of the world! This is Andy’s DAF and trailer. Another terrrible sunset in Oz!….really makes the colours in the sticker stand out, very artistic! In the next month or so I will be ordering some more stickers, so if you want to join the club, I will let you know when they are here and you can buy one for yourself, on the premise that you send a photo of the sticker some where on the move! 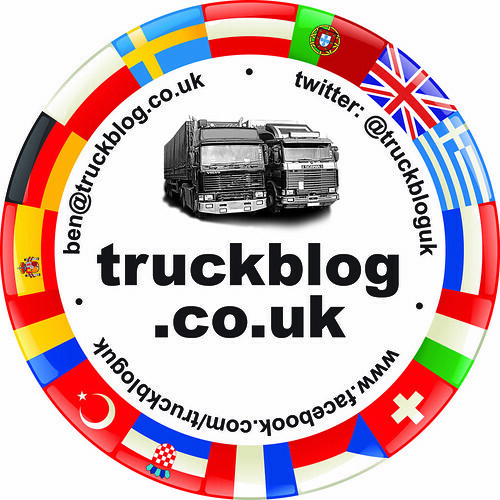 Email me; ben@truckblog.co.uk If your sticker pics haven’t made it to this update, they may well make the next…..